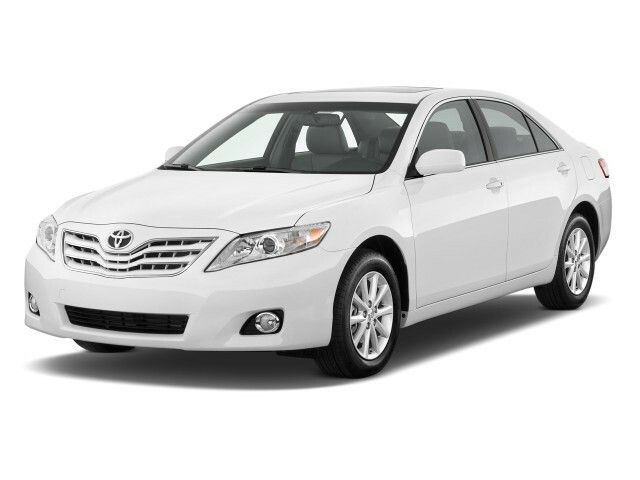 The 2010 Toyota Camry Hybrid is almost $3,000 less than the nicest XLE model of a V-6 Camry. 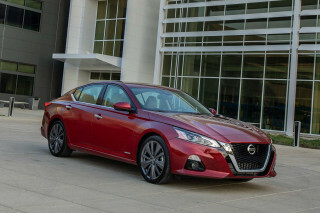 And with the arrival of the Ford Fusion Hybrid, Toyota dealers have stiff competition to the Camry Hybrid for the first time, so they may be more willing to bargain on price than in previous years. The 2010 Toyota Camry Hybrid offers all the benefits of the well-known Camry sedan with Toyota's proven, reliable hybrid system to hit the market's sweet spot. 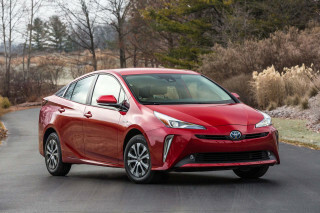 TheCarConnection.com studied a range of reviews pertaining to the 2010 Toyota Camry to produce a comprehensive full review. 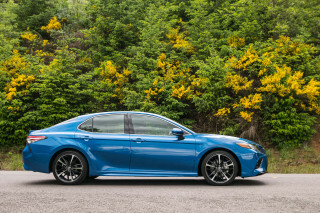 TheCarConnection.com’s editors have also driven various versions of the Camry and report here with firsthand impressions of its strengths and weaknesses versus rival mid-size sedans. The best-selling Toyota Camry sedan was last completely redesigned for 2007, and for 2010 it gains a number of improvements, including a new engine, slightly different front and rear styling, and better safety equipment. The Camry now stands as one of the most conservative-looking sedan profiles, but Toyota makes an effort to dress it up a little bit for 2010 with a new grille, front bumper, and restyled tail lamps. 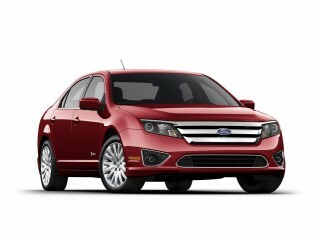 Wheels are upgraded to 10-spoke 16-inchers on the XLE, while the SE still runs on 17-inch alloys but with a new design. A 268-horsepower, 3.5-liter V-6 remains available, but the newly standard engine is a 2.5-liter four-cylinder, making 169 hp. SE four-cylinder models get a more powerful version good for 179 hp. Four-cylinder Camry models come with either a six-speed manual or new six-speed automatic transmission, while the V-6 comes only with the automatic. The four-cylinder engine has plenty of power for most types of driving, but the V-6 is the choice for those who often travel with a full load or need strong high-speed passing ability. Both engines are surprisingly quiet and refined, and fuel economy is better than before with the four-cylinder, at 22 mpg city, 33 highway with the manual and 22/32 mpg with the automatic. With those two engines and a seven different models in all, ranging from the base (and quite stark) CE model to the sporty SE and luxurious XLE, the 2010 Toyota Camry can satisfy almost any mid-size sedan shopper’s need. Most Camry models have a rather soft ride, though the SE grade gets stiffer suspension settings and other performance improvements. Throughout the lineup (except the SE), don’t expect sporty handling. The 2010 Toyota Camry has a very roomy interior, with plenty of legroom in back for most adults and enough space for five. Overall, the design is a little understated and conservative yet upscale; controls are intuitive, not needlessly complex. The only issue remains materials that seem unimpressive, especially at the top of the model range, where prices can exceed $35,000 for a loaded XLE V-6, and TheCarConnection.com has seen multiple test vehicles in previous model years with flaws and unimpressive build quality. The safety feature set of the Camry is improved this year. Front side airbags, full-length side-curtain bags, and a driver’s knee bag are standard across the model line, and electronic stability control is newly standard for 2010. Crash-test results are solid for the Camry, with "good" results from the IIHS—except for a "marginal" rear-impact result—and five-star results from the federal government. The base Camry model includes air conditioning, power windows and locks, and a CD sound system—enough to please the most frugal buyers, especially considering the sticker price is around $20,000. Newly optional on base and LE Camry models is an upgraded audio system with Bluetooth, a USB port, MP3, and streaming music capability. A 440-watt JBL audio system (with Bluetooth technology) is standard on the XLE, as are keyless entry, dual-zone climate control, heated mirrors, and a garage-door opener. A DVD-based navigation system, heated seats, leather upholstery, and a Smart Key entry system with push-button start are all optional on the XLE and SE. The 2010 Toyota Camry is marginally different from its predecessor, but still characterized by move-along, nothing-to-see-here styling. Toyota’s venerable Camry lineup, which has been the best-selling mid-size sedan in the United States for years, gets a minor face-lift for 2010. The current seventh-generation Toyota Camry debuted in 2007. While the current Toyota Camry is rather aged, Toyota endeavors to breathe some styling pizzazz into the Camry with a slew of exterior changes. Chief among these changes, according to Edmunds reviewers, are “a restyled grille and taillights,” which come standard on each of the “four trim levels—base, LE, SE and XLE.” Despite the changes, TheCarConnection.com’s editors find that the 2010 Toyota Camry remains one of the most conservative-looking sedans around. A strong V-6 alone isn’t enough to give the 2010 Toyota Camry a sporting personality, but comfort-seekers will rejoice at the soft suspension tuning. The Camry’s plain-vanilla performance characteristics are a perfect match for its largely forgettable styling elements. The only real disparity between looks and performance comes in the SE model, which gets sporty trim pieces but fails to deliver on the road. 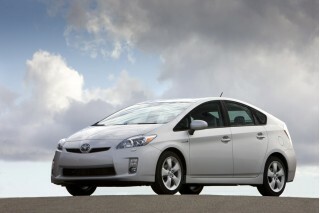 For Toyota, 2010 marks the introduction of a new-and-improved four-cylinder engine to the Camry lineup. Last year’s Toyota Camry offered a six-speed automatic for only the V-6, but for 2010 Toyota introduces the six-speed to every model in the Camry lineup. This includes both the manual and automatic transmissions, and for most four-cylinder Camrys, Edmunds says that “a six-speed manual transmission is standard.” The only exception is the Camry XLE, “which comes only with a six-speed automatic,” according to Edmunds. The auto is also the exclusive transmission option for the V-6. Few competitors offer six-speed transmissions on their base models, and Left Lane News asserts that the “six-speed automatic puts it in fairly elite company.” TheCarConnection.com’s research shows that the six-speed is rather smooth, and Left Lane News appreciates that it is “quick to kick down into fifth for highway passing.” The auto also features a manual-shift mode, but reviewers recommend leaving the transmission in drive. The 2010 Toyota Camry is spacious and comfortable, but it's no longer that impressive in the details. The Toyota Camry lineup has, in the past, been renowned for its reliability and quality, but reviews read by TheCarConnection.com show that the Camry’s lead in this area may be slipping. In addition to a modest decline in versatility, the 2010 Toyota Camry exhibits more marked decreases in overall quality. Edmunds reviewers decry the Toyota Camry’s “spotty fit and finish,” while ConsumerGuide is surprised to find “unsightly seams, misaligned plastic panels, and assorted interior squeaks and rattles” on the normally bulletproof Toyota Camry lineup. Left Lane News reports similar flaws in materials quality, warning that “the silver-painted plastic trim is susceptible to scratches from everyday use, while the felt-like cloth upholstery is bound to be a shocker when winter rolls around.” Overall, reviews read by TheCarConnection.com show an irrefutable decline in the Toyota Camry’s quality. The addition of standard stability control to the 2010 Toyota Camry addresses TheCarConnection.com’s one major complaint with last year’s Camry. The 2010 Toyota Camry builds upon the safety record of last year’s Camry, adding a few new standard features and improved sightlines. The Toyota Camry has been subjected to all of NHTSA’s and the IIHS’s various crash tests, and the results are superb. Edmunds raves about the Toyota Camry’s “excellent crash test scores,” which include perfect five-star ratings from NHTSA in every impact category, as well as similarly high scores from the IIHS. In IIHS testing, the 2010 Toyota Camry earns the highest possible rating, "Good," in both the frontal offset impact and side impact categories. In addition to class-leading crash-test scores, the 2010 Toyota Camry soldiers on with a long list of standard safety features. Like last year’s Toyota Camry, ConsumerGuide reports that the 2010 model gets “ABS, traction control…front side airbags, curtain side airbags, and a driver knee airbag.” The driver knee airbag is a particularly handy feature, as Cars.com points out that it is designed “to keep the occupant from sliding down and forward (submarining) in a collision.” In addition to the features carried forward from last year, Edmunds says that “stability control is now standard across the model range” for the Toyota Camry. With a wide range of trim levels and base prices, the 2010 Toyota Camry should, from a value standpoint, appeal to many mid-size sedan shoppers. The 2010 Toyota Camry delivers on its value proposition, at least in the lower trim levels. The base Toyota Camry starts at just $19,395, but TheCarConnection.com’s editors find that a fully loaded Camry can run well into the $30,000 range, where it seems out of place compared to some of the other vehicles in that price category. The Toyota Camry lineup begins with the base model, which debuts with “air-conditioning, auto up/down windows for all four doors, a six-speaker CD audio system” with auxiliary input, and little else, according to Edmunds reviewers. The Toyota Camry LE is similarly equipped, adding a power driver’s seat and keyless ignition to the mix. 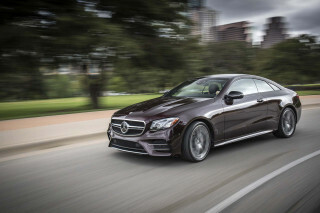 Overall, Left Lane News feels that the lower-end Camrys have “few ‘oooh, ahhh’ features beyond the electroluminescent gauges and power driver’s seat,” especially considering the price tag. The Toyota Camry SE is less a features upgrade than a supposed performance upgrade, and it boasts unique styling elements and larger wheels. At the top end of the range is the Toyota Camry XLE, which gets USB integration, although one Cars.com reviewer states that he “was not a fan of” Toyota’s MP3-player interface. Edmunds says that the Toyota Camry XLE also gets “an upgraded JBL-branded sound system,” which significantly outperforms the standard audio system, and “satellite radio,” among other features. 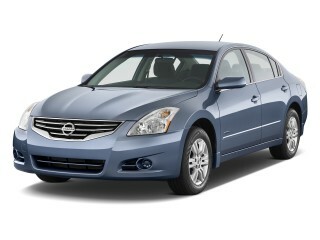 Very reliable, comfortable and stylish. 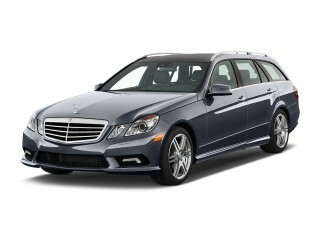 I average 35+ mpg and have gotten as high as 49+ mpg on a trip with comfort and plenty of room.